Allen & Washington district, Pasadena. Caption only. K9, 10: Mrs. B.A. Manzer of Altdena and 5 year old daughter, Cindy, looking at prize winning (3rd prize) Halloween scene painted on store window at Allen Avenue and Washington Street, Pasadena. Drawing done by Vita Sedlenick, 14, of Marshall Jr. High. K32: Mrs. Q.W. 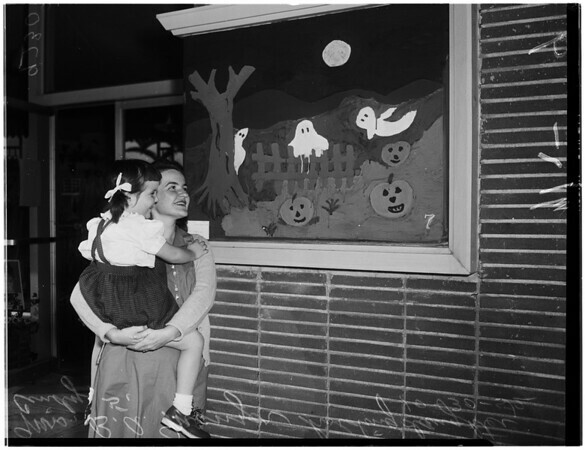 Larkey and twins, Nancy and Susan, 8, looking at 2nd prize winning Halloween painting at Allen Avenue and Washington Street, Pasadena painted by Sigrid Swanstrom of Marshall."